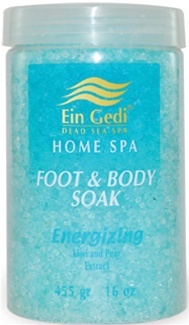 Energizing Foot & Body Soak 455 gr. Energizing - Foot & Body Soak - 455 gr. body aromatherapy treatment. The Dead Sea Minerals, some of them enrich with Essential Oils offer you a total sensual experience' for your muscles, skin and spirit. Instructions: Pour between on to four ounces in a basin or bath with enough hot water to allow the salts to dissolve quickly. Add cold water to obtain a moderately pleasant temperature. Enjoy for 15 minutes and then rinse skin with warm water. Warning: Do not use for skin with sores or scratches and avoid getting salt water into eyes. 455gr. 16oz. Mineral Rich Bath Salt -Natural-400gr .